PinkyPiggu: Serenity Spanish Bar & Restaurant @ Ngee Ann City ~ Seafood Paella, Suckling Pig & YouTube Video With Local Singer-Songwriter Lin Sitong 林思彤! Serenity Spanish Bar & Restaurant @ Ngee Ann City ~ Seafood Paella, Suckling Pig & YouTube Video With Local Singer-Songwriter Lin Sitong 林思彤! PinkyPiggu spent a Saturday afternoon with a pig! A very delicious Spanish Suckling Pig! Haha! Many a times we are caught up with pursuing the latest food fad, or checking out the trending talk-of-the-town, and lose out in embracing gems which might be dismissed as "boring" only because the place has been around for sometime. Casting any restrictive mindset aside, I visited Serenity Spanish Bar & Restaurant. How was the experience? As heart thumping exciting as a flamenco dance! My tummy was serenaded with gratification in every chomp! 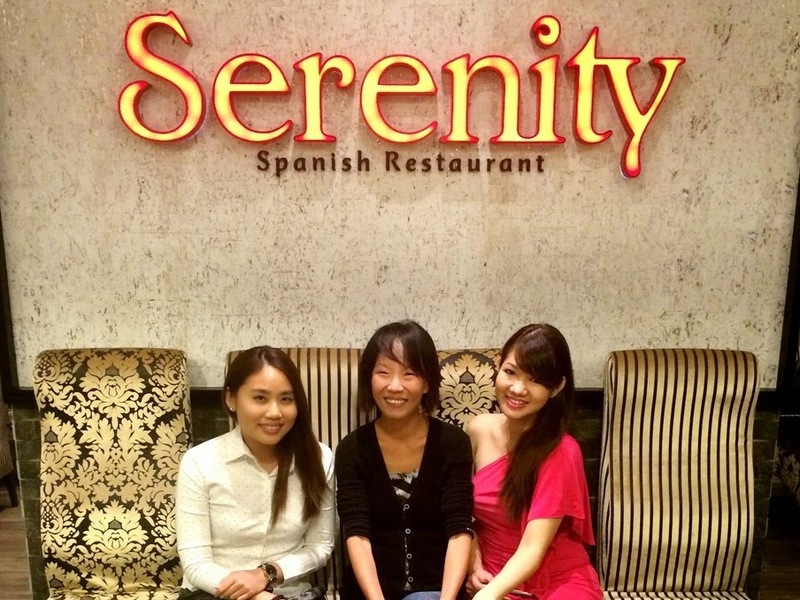 Established since 2008, Serenity Spanish Bar & Restaurant is one of the few restaurants which pioneered (and still surviving) Spanish cuisine in Singapore. From the first flagship outlet in Vivocity, the popular restaurant has even expanded overseas into Bali, Indonesia, and a third outlet in the heart of Orchard Road at Ngee Ann City in 2013. Spanish cuisine brings to mind tapas, paellas, sangrias and much more, an augmentation of unique and colorful flavors from the different regions in Spain. The menu at Serenity represents much of this food culture with offerings of over 60 items. Signature fare includes Seafood Paella, Pork Knuckle, Honey Pork Ribs, Stewed Oxtail, and the one thing you must definitely try is of course, the Suckling Pig! I only wish my tummy is vast enough to conquer it all lol! It would be wise to commence with some tapas first while waiting for the mains to arrive, as dishes like paella needs quite a bit of cooking time (at least 20 minutes) and are prepared ala minute to ensure optimal freshness and taste. Hehee I don't mind waiting at all as the savoriness of Baked Baby Asparagus wrapped in Bacon ($16.80) started us off on a delectable note. The Croquetas ($16.80) were all of homemade crunchy goodness encased with creamy chicken slivers, and another appetizer which I would strongly recommend for you to try is the Spanish Tortilla ($10.80). I must say the ingredients of this omelette are rather basic, just potato, egg and onion. Simple right? But but but, combine them together, that's when the magic begins. The warm softness of thinly-sliced potatoes inter-weaved with eggy aromatics and underlying sweetness of caramelized onions were utterly enjoyable. Simplicity at its best! Good food are meant to be shared, and I was happy to have our local singer-songwriter Lin Sitong 林思彤 joining me in this meal too. We both agreed that the Seafood Paella ($68/$136) was another scrumptious treat. The key to a great paella lies in the rice, and Serenity uses Bomba rice, a variety which is said to absorb 30% more broth (compared to the usual), thus infusing the dish with more flavor. Laced with saffron spices and well-cooked to a delightful soft fluffy texture contrasted with bits of slightly charred rice at the base of the pan, the paella was exceedingly pleasing in every spoonful. The seafood medley of tiger prawns, squid, mussels, dory fish were fresh and generous in portion. It's hard to resist stuffing all of this hearty yumminess down! But finally, the ultimate highlight arrived! The Spanish Suckling Pig ($388)!!! Its entrance was a sight to behold, perched on an enormous wooden platter and high over the shoulders of our server, Jerry. What a stunner! Our piglet was so tender that it can be cut with a plate, no knife needed here, and the action was swiftly executed by Jerry in matter of less than a minute! Wow! We can hear the crackling of its golden hue skin and it wasn't too long before we quickly sank our teeth into the paper-thin crispiness. We devoured the flesh with much gusto too, wasting no time in reveling its succulent meatiness. The piglet was marinated with sherry wine, white wine, vinegar and herbs before being slowly roasted for more than 6 hours to achieve this richness and complexity in flavors.The accompanying brown sauce elevated the tastiness to another level. Too too too lovely in all senses. I boldly declared that it is my number one pig now! 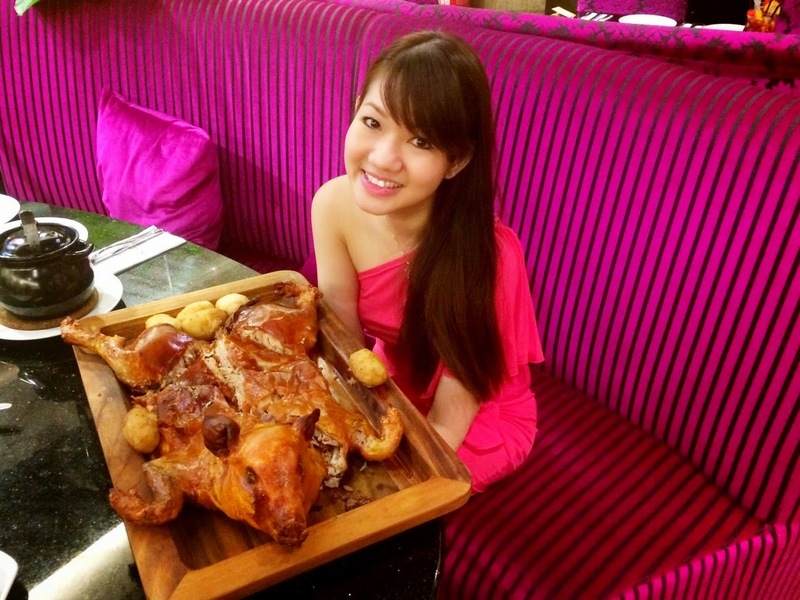 To have a whole suckling pig (2kg-3kg) for our dining group of 5 pax was quite an indulgence, as the full serving ($388) is good for 6-8pax. It is also available in half ($198 for 3-4pax) and quarter ($108 for 1-2pax) portion for all-day dine-in as well as takeaway. If you wanna astound any party or family gathering with a surprise gift, the suckling pig would certainly make a most suitable choice. Traditionally, Spaniards will throw the plate used to cut the pig on the floor or into a wooden box, believing it will throw away all the bad luck. I partook in the fun as well and had a "smashing" time haha! Thanks to Pin of Serenity for being such a gracious host, and Sitong for joining us. I have to breathe so hard and try to keep my tummy in after relishing in this fantastic meal!